It seems Everyone is Related to Everyone! More and more I find myself writing on genealogy rather than events or places. This is fine except I do not consider myself a professional genealogist, nor do I aspire to be one. When I began my research of the Dunnville area, I looked in old newspapers for names familiar to me and if I found a death notice or marriage, I would record it in my notes and add it to my genealogy program. Soon I began connecting those names to others for whom I had no personal interest, other than they in some way were connected. 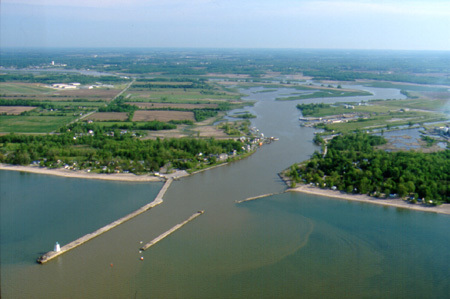 This led to what has become a rather large data base of nearly seven thousand Dunnville area people and another three thousand of my relatives loosely connected to many of these Dunnville people. The program I use is Family Tree Maker, a rather popular software for this type of thing. It permits me to add seemingly unrelated individuals, and provided I have other connecting family members, the software makes the connection. Suddenly, two people who pass each other on the street daily find they are 2nd 3rd or even 5th cousins! Whenever I meet someone who ask me if I have any information on a family, I check it out and if the questioner has email, they get a response. More and more that response is a positive one. At the Port Maitland Festival of History in July, I had a couple of those requests. One was from Faith lannandrea, Nee Shank. I knew I had a little bit of Shank family info as I have collected the Siddall genealogy rather extensively and I knew Annie Irene Siddall was the first wife of the late Emery Shank. Emery was a well-known fire and brimstone preacher in this area and founder of the Shank Tabernacle and Sunday School. Annie Siddall died young leaving one child Muriel Lorraine. Emery later married Mary Scott, a fabulous lady who preached right along side him and whom I have written about in earlier articles. Faith asked me to send her what information I had, which I did. This usually leads to a month or so long email relationship. In this case my contact with Faith, led me to a secondary source. I forwarded Faiths inquiry to Sylvia Weaver co-chair of the local Ontario Genealogical Society - Haldimand Branch. Sylvia knew just what to do with it. She passed off my email to Doris Thomson, the secretary of that organization, who. . ., guess what? Doris is a descendant of Mathias Shank and Catherine Everett, Faith's grt-grt-grand parents. Remember in the last couple articles, I told you in a small town you had better be careful what you say about someone, as everybody is related to someone in some way. Not more than twenty-five feet from my booth at the Port Maitland Festival of History, was Doris Thomson, Nee Huber. There was Faith's 2nd cousin only a few short feet from her, ready to help anyone who asked for genealogical information and neither of them knew each other. Had Faith asked Doris instead of me, she would have met her cousin and made some great family connections. Their meeting will happen and I am pleased to have played a part in putting two long lost cousins together. The above sentence would have been a great ending to this short story, but it is only the beginning. Darryl our newspapers managing editor will not give me enough space to write the whole story in one article. It seems Doris Thomson and I have found ourselves in one of those email relationships as I pester her for every teeny detail on her families genealogy. She made the mistake of thanking me for connecting her to Faith and then wrote this. "My grandparents are Lloyd Huber & Effie Shank. I have lots of history on the Huber, Shank, Gilson and Carpenter lines." Me thinks me is going to add a few hundred new names to Dunnville's genealogy and connect even more families. Already I have learned Doris's late husband and father of her two children was Thomas Meyer. My next email to Doris is to find out if she is related through him to a cousin of mine, Joann Armstrong, Nee Meyer of Cayuga.